So it finally happened. The old phone stopped charging again so I got a new phone and switched to 3 in the process. One problem I was having was with tethering. I am on 3's "one plan" so tethering is included on my plan. When I tried to connect over the wireless hotsopt set up normally in the settings, I could not get a connection to the internet. The computer connected to the phone ok but not on through. The same problem was present with USB connections. The solution came from a forum, which I have lost or I would credit, and involves adding "dun" to the "APN type" setting. That is all it takes. Add ",dun" to the list of apn types on the last screen there. The apn on the 3rd screen works for tethering but will not let you use your phone normally. 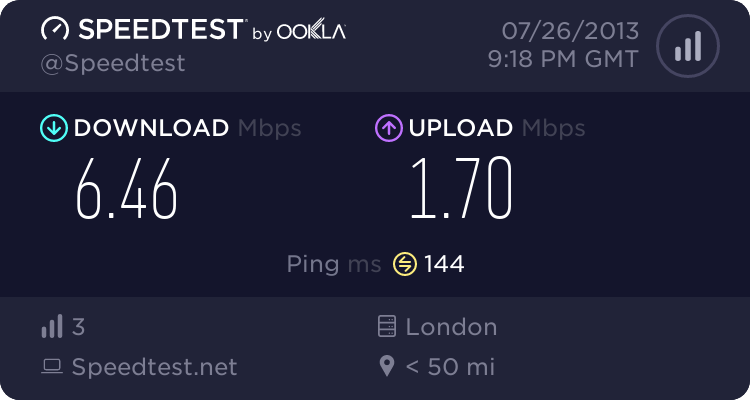 Overall I am happy and impressed with the speeds. Normally a bit slower than below but with a slightly faster ping. Recently I have been trying to get my hands on FLAC music as much as possible. Windows does not appear to support FLAC files in any way. To make windows 7 a bit more FLAC friendly I installed 2 files. "opencodecs" - makes Windows Media Player etc able to play the FLAC format. Oddly this didnt actually solve the problem which I was having. What I really wanted was for Explorer to understand and display the FLAC metadata. "FLAC Property Handler" - Something I stumbled upon (well it was on the front page of google but still) on a windows forum. There was a few different mirrors of it on the forum and I have uploaded the 64 bit version here, just for safe-keeping. That is all it took, lovley extra metadata for FLAC files in Windows 7. Well, I hope you are enjoying it... chances are, if you look at it now, it has been rebooted, sorry about that! Note: I have done absolutely no research into this, so it is all guesses and speculation here are probably wrong. What was also interesting was an AJAX GET request to "http://192.168.0.1/sky_self_heal_reboot.cgi". It didn't look like there was any verification. Sure enough when the address was put straight into my address bar, the router would reboot. Fast forward to today, I tried including an AJAX GET request to that page from this page, but that sort of thing is blocked for security reasons. However iframes seem to be happy enough to load a local resource, and hey presto the router rebooted. Awkard. Update:Ok, Ok, Ok I have removed the actual iframe and just included it as text now so you wont be booted off, it was getting rather anoying, I admit. There has been a bit of traffic from people looking for help with the "Sky Home Hub Self Help" screens. All I can advise, if you are seeing that screen, is that you follow all the steps. Check that all the connections are tight, if you have some spare or old ADSL filters, give them a shot. If you still are not getting connected, chances are that you will need to call Sky and get them out to fix your line, sorry!